In 2014, I lost a bunch of weight on the only successful diet I’ve ever been on. In just a few months , I was able to lose over 30lbs. I believe the diet was successful for two reasons: 1) I was never hungry because all the protein really fills you up, 2) one day a week I had a “cheat day” and ate whatever I wanted. “. I won’t go into all the specifics, but the gist is you basically eat meats and veggies (no sugar, no carbs) and make sure to get 20-30 grams of protein at every meal. To get my 30 grams of protein in, I generally eat 3 hard boiled or scrambled eggs for breakfast. This gets old really fast. 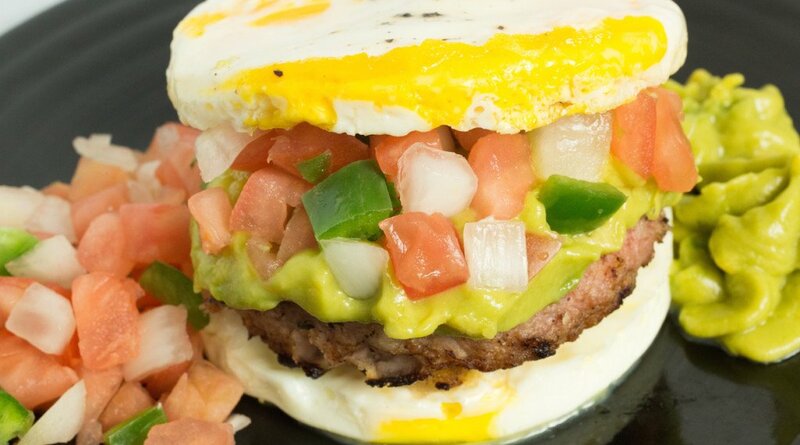 I have a real passion for breakfast sandwiches, and thought it would be fun to try this carb-less version using eggs for the bun. Because I love toppings, I had to throw some guac and pico on top. 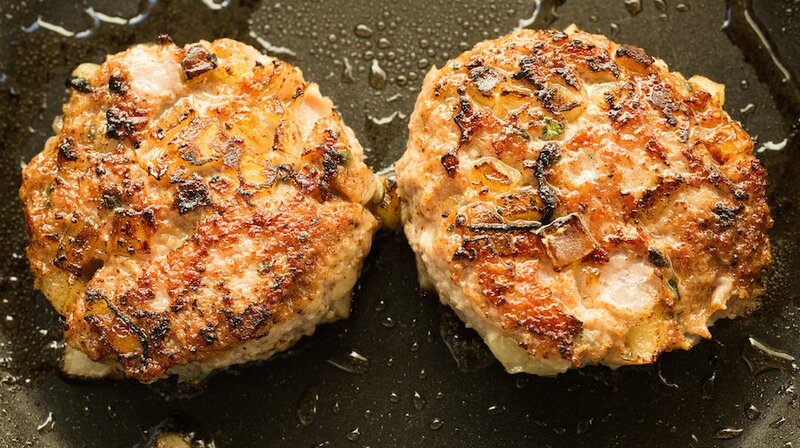 I usually make the sausage patties myself, but of course you can use store-bought as well. If you are going strict slow carb, make sure to leave the green apples out of the recipe. I leave them in because I just like to live on the edge like that. , preferably two. If you only have one, you will just have to make them one at a time, and because it takes a few minute the first egg will probably get cold. Nobody likes cold eggs, especially first thing in the morning! You can get creative with the toppings if your heart desires. If you do something different and it works out, please let me know so I can try it! Heat a skillet over medium heat. Add ghee. When shimmering, add the onions and sauté until translucent, about 3-4 minutes. Add the apple and cook until soft, another 4-5 minutes. Allow to cool. In a large bowl, combine the pork, apple, onion, sage, fennel, salt and pepper. Form into 4 sausage patties, using one of your biscuit cutters to achieve the correct size. Heat the skillet over medium heat again. Add a tablespoon of ghee. When shimmering, add the sausage patty. Cook the sausage fully, about 2-3 minutes each side. Set aside. Take two small bowls and crack an egg in each. Pierce the yolks with your fork and give it one little stir. Grease each biscuit cutter with a little bit of ghee. Heat a pan (make sure you have a lid) over medium high heat. Add the remaining tablespoon of ghee. When it is shimmering, place the biscuit cutters in the pan. Pour one egg in to each mold. Season with salt and pepper. Add the 1/4 cup of water to the skillet around the biscuit cutters. Turn the heat down to low and cover the pan. 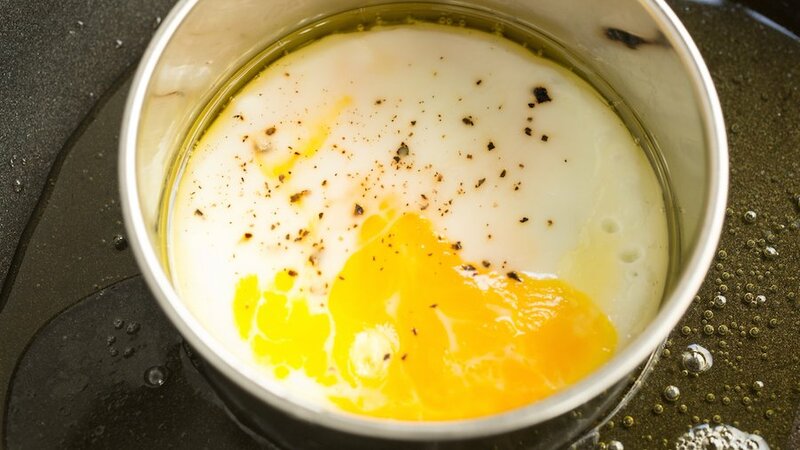 Cook for 3 minutes, or until the eggs are cooked through. Move to a paper towel lined plate. 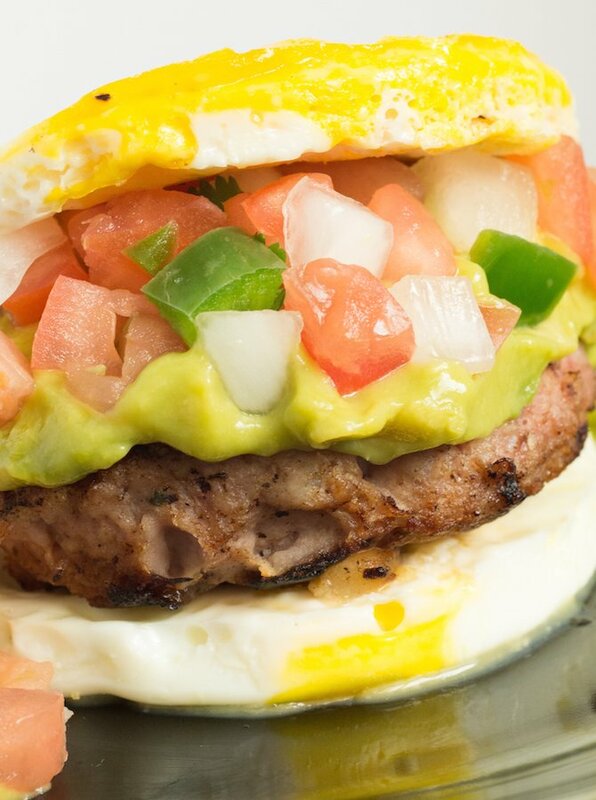 Assemble your Slow Carb Breakfast Sandwich by placing a sausage on one egg, adding the guacamole and pico de gallo, then placing the other egg on top. This is so delicious looking! I love the Mexican flair! Thanks for sharing. This is what I want for breakfast — we are having cereal 🙁 I really like the Mexican touch to the usual taste. Can’t wait to try it. This is so creative. I love this idea. Will have to give this a try! You’ve put a lot of my favorite flavors in these. Looks like my kind of breakfast! I love a good savoury breakfast! This sounds great.